Now that im not modeling for my own online shop , it is time to take good care of my hair. Constant styling dried up my hair. Kinda disappointment when i went to Korea in March hoping to get C-curls done but i couldn’t because of my bad hair condition. The ends were damaged and i have to cut off at least 5 inches if i want to go for C curls. Whenever my friends are going to Korea, they will message me for hair salons recommendation because i always get my hair done there ( cut , wash , dye and hair treatment ). Prices there are very cheap actually. Cheaper than any salons in shopping malls and their services are impeccable. Like the one i went in March – Hwamiju Hair Salon. When i walked in , a staff greeted me and gave me the “hair menu” when i asked for it. I told them what i wanted to do which was C-curl perm (and my bf’s mother insisted to the staff and asked for the salon’s top and head stylist to evaluate my hair because she doesn’t want anyone to do my hair just like that. She knows that for good curls , you need to have good hair condition ) . The lady lead us to a wating area where there is a huge sofa , coffee table and magazine . A lady asked if im hungry and what drinks i want. She brought alot of snacks and coffee for us because i told her i was quite hungry. Another lady brought me to a nice locker room to keep my belongings and passed me the key. She then helped me with a robe. And i went back to my seat to have my coffee and snacks . She put a pillow on my lap so that i do not need to strain my neck when i read the magazines. Then she brought me to one of the seats and the head stylist started evaluating my hair and concluded that my ends were damaged so i can’t get it done 😦 Either i have to cut 5 inches ( which is long bob hair ) or maybe just next time. Then , another lady brought me back to my sofa so i can continue my coffee , snacks and magazines while waiting for my bf to cut his hair. Their services are great. I had my hair dyed , treated , cut , wash and blow before. The hair stylist stayed with me from start to end. The only time i have to wait was to wait for her to bring her tools or serums etc. Whereas in SG , some salons tried to maximize profit and allocated 3 customers to one stylist within the same time slot. I ever had an experience where a simple and basic hair cut , dye , treatment , wash and blow took 5 hours from lunch till almost dinner time. I remember i have to wait 20 minutes for the stylist to check my hair after the shampoo lady finished applying the hair dye. And then another 20 minutes after washing the dye off before confirming with the shampoo lady what treatment for me and another 20-30 minutes after the treatment wash or stylist to come and another 15 minutes for stylist to come after shampoo lady dry my hair for the stylist to do the final touch up. Spent almost 2 hours waiting for nothing when all could be done in just mere 2-2.5 hrs. Total took 5 hours. My hair cut , dye , wash , cut and treatment took only 2.5 hours in Korea. 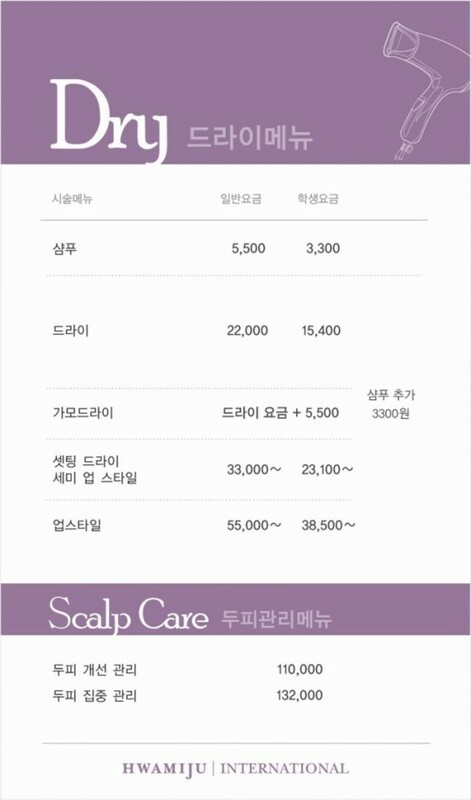 Some of my friends told me they went to some salons in Gangnam and were charged more than $400 for a perm. Well, some salons target tourists and they price it very high. Or you go to those super high end ones then yes maybe it can be very expensive but for a popular local salon chain it should not be that expensive because i was never quoted for that kind of high price. 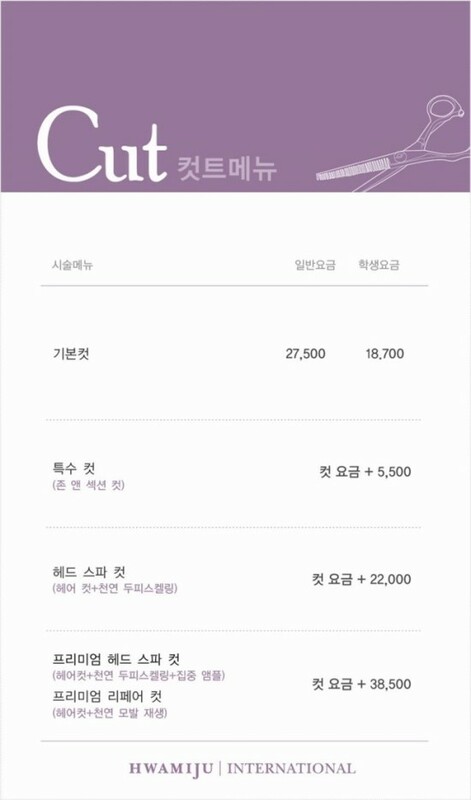 I was quoted only KRW 120,000 for hair dye , 4 steps treatment , cut , wash and blow at a popular local salon chain and KRW 80,000 for C-curl perm at Hwamiju for my hair length and my friend went there for s-curl perm and paid only KRW 120,000. The prices were from the “hair menu”. Perhaps when you go into the salon , instead of asking for price , ask for the menu instead so that you can see the prices yourself. But of cos , some menu are only in Korean so if you can’t understand or read, it will be abit of a challenge. My bf’s mum told me that perms are not very expensive in Korea because alot of people do C-curls or S-curls which are very common and normal. I got this from Korean internet Naver.com for you guys. 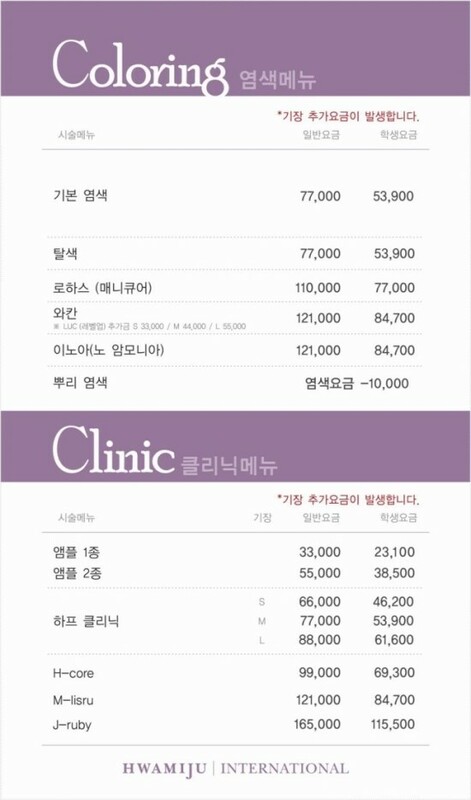 But im not sure if this is the updated price list or not ( The source was dated 2013) . So you have to ask to confirm the price again because it depends on your hair conditions , length and what kind of perm you want to do. This is just a guide okay and gives you a rough gauge of the price. Hwamiju is a popular and good hair salon and has alot of chains. My bf’s m0ther recommended this one to me and im super impressed with the service ( though i can’t get my hair perm done ). First column reflects normal price and 2nd column ( which is the cheaper pricing are local student price ). 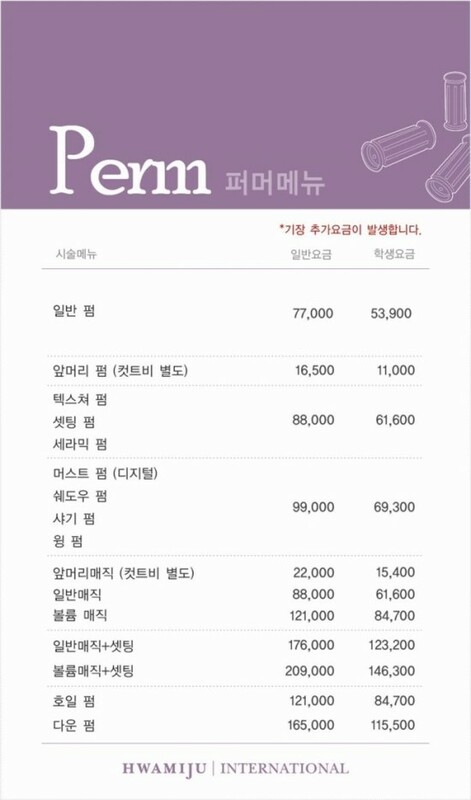 The most expensive one KRW 209,000 is Volume Magic and Setting Perm. Some people do volume magic at the top part of their hair and setting perm at the bottom. Volume magic is a kind of rebonding which doesn’t flatten your hair like those normal rebonding. The first impression on rebonding is that you will end up with hair that is so flat that sticks to your face. But nope .. i had it done before and this kind of rebonding actually adds volume while keeping your hair straight and doesn’t flatten your hair. So , im super determined to get my perms done. So i need to maintain and get it treated right ? 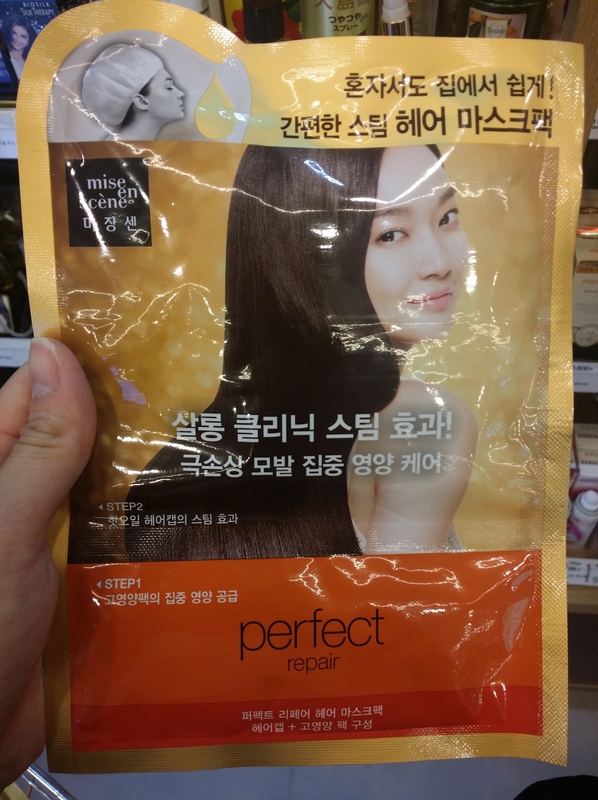 So during my trip to Korea, i went to buy my 6 steps hair care from Mise-en-scène . It was a last minute buy just the night before i flew back to SG. I wanted to buy Daenggi moori and another good brand but i couldnt find it at Lotte Mart so i got this cheaper one instead since 2 shampoo + 1 condition is going at a promotional price of KRW 10,000. So i got another 2 tubes of treatment , 2 repair hair oil and 1 hair essence under the same PEARL SHINING RANGE. I love this shampoo because of the smell and it doesnt dry up my hair. And i got these 2 too from Olive and Young. I bought 10 packs home. They cost KRW3,900 and KRW 4,500 respectively. These are hair steam pack .When you go to salon for hair treatment , they coat your hair with some serums or hair oil and steam your hair right ? Now there is the DIY version in Korea, just apply the hair serum/oil (which is included in the pack) and wear the hair cap that was given. You will slowly feel the heat in the cap. Wash off after 20 minutes. The first one was from Mise En Scene. 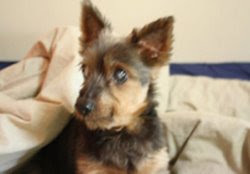 It is 2 steps treatment. Step 1 , tear open the bottom orange portion and spread the treatment cream on your hair and massage. And then tear the step 2 part where the cap was. Wear the hair cap , fasten it and massage your scalp. You will slowly feel abit of heat and then just wait for 15 minutes before you rinse it off and condition your hair. I tried this and my hair comes out very smooth and smells soooo nice. I do this treatment before i go out so that my hair looks really nice before i go out. Easy to comb , blow and curl with hair curler. Smooth and nice. Cost KRW 3,900 at Olive and Young but it is cheaper in Lotte Mart ( KRW 3,000). This was from Mediheal and cost KRW 4,900 at Olive and Young. I cant find it at Lotte Mart. Mediheal has nice and good facial and eye masks too which are available at Olive and Young. I bought their eye patch masks and i love it. 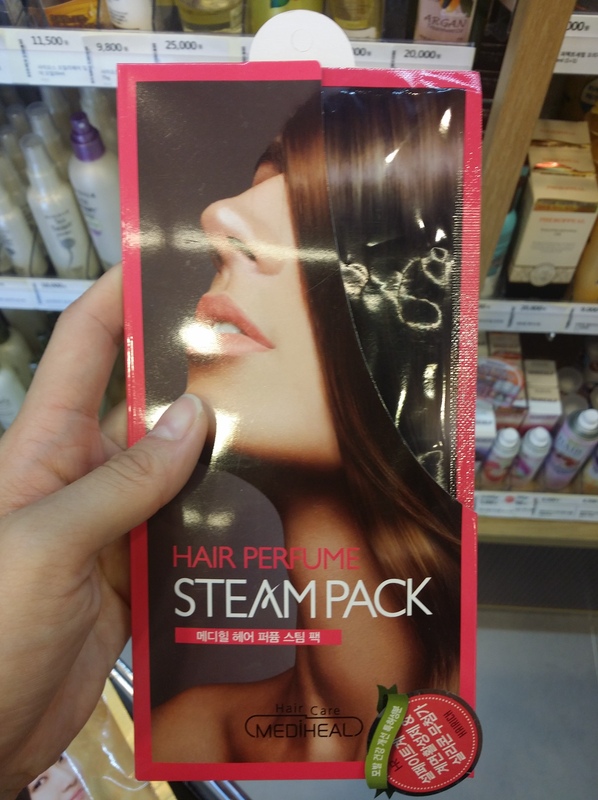 I didnt know they have hair steam packs too. This one is abit different from the one on top. This is just 1 step. The hair cream is already in the cap. So you just need to wear the cap , fasten it and massage your hair and scalp. The heat from this pack is stronger than the one from Mise En Scene. The heat from the Mise En Scene steam pack not that strong but this one i can feel the heat on my scalp. Results also come out with smoother and manageable hair. It smells really good too ! After 15 minutes , just wash off and then condition your hair. These are hair saviors because my hair was very dry due to constant styling during shoots. I have been using these for 2 months and so far so good. Im gonna get my Daenggi Moori shampoos next time. More K-beauty and K-food in a couple of days – Facials and Food ! This entry was posted in Korean Hair, Mise En Scene Hair and tagged Korean Hair, Korean MakeUp, Mediheal, Mise en scene. To be a beautiful woman… you really cannot be lazy… thanks for all the tips and recommendations! haha ya ..very busy keeping ourselves beautiful..better start early before its too late.